The exploration, the experimentation and search for forms connected with nature are the primary focus of the series of works in the present exhibition. “Water” exams—the actions. Nedko Bucev performs following the natural gravity and the behavior of visible light and its transformations. Manipulating materials, separating into stages the painting process a different sense of space appears. Following the natural attraction of colors, he rediscovers pigments and painting techniques. Clustering and manipulation of space, gravity and chemical reaction of paint solutions are the essences of his creative process. Bucev uses the word gravity often. Employed in his art context, it means of signaling the polar opposite of rational judgment and sound logic, the term also implies a type of action that is entirely beyond human control, a meaning that seems to move outside the bounds of the dichotomy that he strives to set up between the rational and the subjective. While held on to a systematic approach to artistic production, he recognized that only by moving past the tautological thinking of rationalist artistic approaches could one arrive at new forms and experiences. The artist also probed the relationship between order and disorder, between serial methodology and antirational processes, yet his work delineates an opposing limit of this practice. Bucev’s work is notable for the way in which it implicates the color and paints in new ways. He worked with the controlled grid, but was equally interested in the potential for an accident, embarking on what has frequently described as a form of compulsive repetition and accumulation of color and water. He worked with the controlled grid, but was equally interested in the potential for an accident, embarking on what has frequently described as a form of compulsive repetition and accumulation of color and water. The color is the ultimate artistic idea. It has spiritual content and material form in an ideal balance. The color is in function of itself. He wants a clear vision with no message. Nedko creates a visual plenitude, which the only function is to be seen by the viewer and sometimes even this is not required. The recurrence of the paint/water flow involves a mechanical gesture created by the river or the current of the river, yet the result is decidedly uneven; upon closer inspection, the irregularities of each artwork reveal themselves. Diversity and variation are achieved not as a function of rules of permutation, but as a result of the uneven surface and the control of the artist’s application of pigment on the paper. It endows the artwork with a decidedly personal, tactile dimension that opposes the strict reductivism of contemporary abstract painting. New York, NY 10003. The exhibition is named Water and consists of large format watercolors on paper. This is Nedko's first show in New York City. At the opening reception will perform the pianist Ana Rosa Hernandez and the jazz quartet of Flavio Lira . 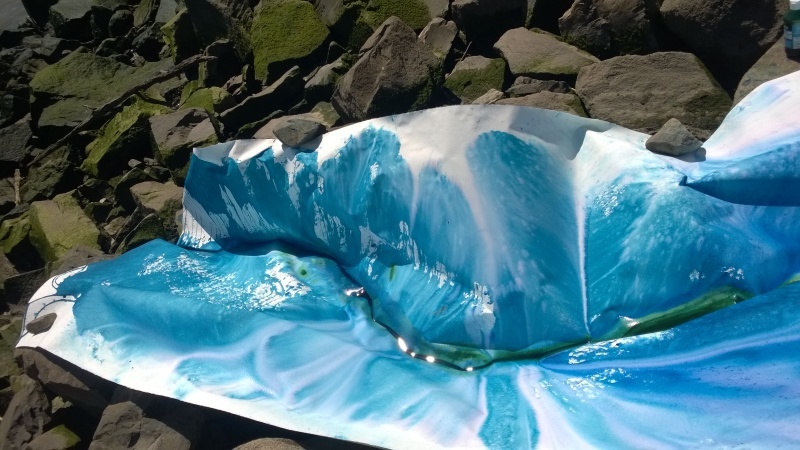 The visuals on paper and the live music both draw art inspirations on the water. For images related to other projects by Nedko Bucev and Ana Rosa Hernandez, visit /past/ events. "Three pieces for piano" Op. 11 by Arnold Schoenberg Pianist- Ana Rosa Hernandez Painting Nedko Bucev This video is about the relation between the Atonal Music and colors. This is the whole original painting video with the piano performance soundtrack.